Welcome to Rêverie, where creativity meets inspiration! Kid and baby clothes, Candles, pottery, soaps, cards - we've got it all! At Rêverie we're constantly searching for sustainable products and brands we can take pride in selling. We value quality and durability while focusing on aesthetically pleasing gifts for you and yours to enjoy. Whether a beginner or an expert we've got knitting materials for all kinds of people and projects. In store we sell a variety of yarns from brands like: Berroco Yarn, dream yarn, Koigu, Madeline Tosh and June Cashmere. If you don't see what you're looking for ask about a special order by contacting us! Are you an expert ready for something new? What about someone who has never knit before? We've got something for you! Just a sample of the great products we carry! Feel free to contact us with any questions you may have. We are able to do most custom orders upon request. 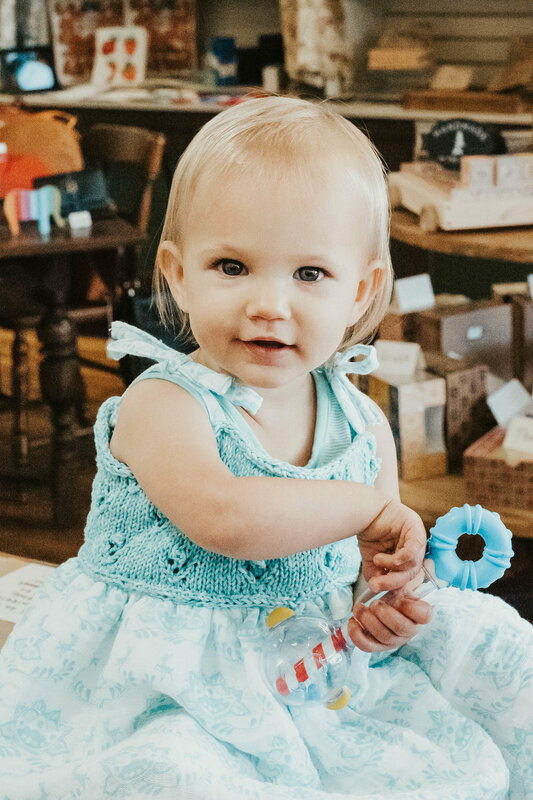 CHILDREN: Employee Trish's beautiful granddaughter wearing the Toddler Sundress from our June (2018) knitting/crochet class! Handmade vegan no-slip Cabooties are on our shelves to stay! Come in to find out why we love them so! A store favorite, Jelly Cats from London are always here to welcome you, and so are we!